It probably would be more imaginative to go in a different direction. I mean, we could talk about a Hall of Famer in Wilhelm who passed through early on in his career. We could talk about the Mets phenom who came over and highlighted a couple of dismal teams in Jefferies. We could use Konstanty to highlight the trend of former All-Stars who come to St. Louis and never go anywhere else, like Larry Walker, Chuck Finley and Will Clark did. As we get closer and closer to the end of our countdown, the names become more familiar and the choices a little harder. That said, there was no way McGwire wasn’t going to be our pick today. He looms over the franchise like the larger-than-life player he was, though his shadow is now darker than it was when he was playing. Look, let’s acknowledge the fact that he used steroids during his reign as baseball’s home run king. It was wrong and while I do believe McGwire used them more for healing than to bulk up, the motives don’t matter that much when you are going against the rules of the game. There’s no doubt that 1998 looks different from the lens of 2015. Yet I doubt I’ll ever experience a summer like that again. I’ve probably talked about this before, but I can still remember so much from that season, from “watching” him hit a grand slam on a crude early version of ESPN GameDay on Opening Day to jotting down his home run total on my work calendar each time he went yard after 45 or so. I remember the surge in Florida. I remember exactly where I was when I watched 60, 61 and 62 leave the ballpark. I remember that last weekend, when Sammy Sosa had briefly passed McGwire at 65 and seeing Mac come up for an at-bat against the Braves, his first since Sosa’s homer about 20 minutes before. I stood there knowing–absolutely, positively knowing that he was going deep, that he wouldn’t let Sosa stay ahead of him for long. And, of course, he did. Every day the marks of that season are with me. I mean, I’m Cardinal70 for a reason, folks. I’d still like to see him go into the Hall of Fame (though I know he never will) and I’m glad that Tony La Russa got him back into the game. I also think it means something–perhaps very little, but something–that as far as I know he’s the only person to confess to steroid use without a positive test hanging over his head. He’s admitted his mistakes, perhaps too late for him to gain the ultimate baseball immortality, but his admission puts him ahead of a lot of folks, including his partner in crime from that magical summer. 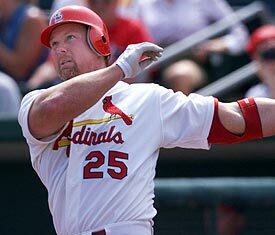 McGwire gave us thrills and memories that, while perhaps tainted now, are still going to be with us for a lifetime. He put St. Louis on the map and I believe a lot of the current success could be traced back to him and his willingness to stay under the Arch. For that, I’m more than happy to salute him as the calendar draws us one day closer to the real season.